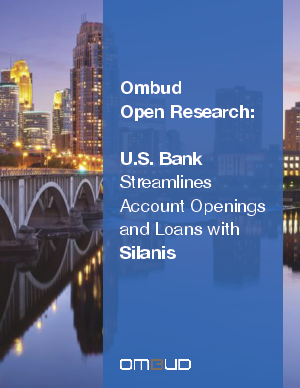 In this case study from Ombud Open Research, you will learn how US Bank is using electronic signature technology to streamline account openings and SMB loans. With e-signatures deployed across more than 3,000 branches, US Bank is leveraging both the Silanis on-premise e-signature solution and the Silanis cloud e-signature service for different processes. As a result, they have achieved operational efficiencies, improved customer experience and increased top-line revenue. The bank is currently e-signing 460,000 documents each week – a number that will continue to grow as US Bank’s initial implementation of electronic signatures is currently being repurposed across the entire organization. According to John Fraser, VP of Technology at U.S. Bank, Silanis’ e-signature technology requires the lowest IT maintenance - by far - within the bank’s infrastructure, which includes a robust data center. Plus, the combination of Silanis e-signatures and US Bank’s infrastructure creates an annual labor savings of upwards of a quarter million dollars when compared to a SaaS alternative. The case study also includes a full-page infographic.